Don’t waste hours searching for new grants, when we’ve got this covered for you. Relax, as we do all the hard work and produce two grant lists each month (one is FREE). Whether you work in a business or are part of a committee, the lists are great time-savers so that you can get on with writing winning grants. The grant environment is competitive, so you need to be aware of all the tips to increase your success. Our grant writing workshops will provide heaps of great ideas and tips to give you a winning edge. Additionally, we’ve been business writers for many years, and organisations use our services to create strategic plans and project plans. These documents are often needed as supporting material for grant applications, and we make sure all the information links throughout the entire suite of documents. This creates professional and effective applications. The Australian Institute of Grants Management conducts research each year, surveying 2000+ community groups. Results indicate grantseekers lack the capacity to apply for all the grants they would like to. The most nominated factors that stopped them are “lack of resources/staff and lack of time.” Our grant lists will save you time and increase your capacity to access new grants. 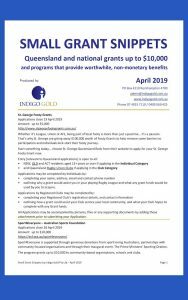 Although we focus on grants applicable to Queensland, many grants are national, so even if you’re not a Queenslander, they’ll still be helpful. Most importantly, includes the amounts available, and links to the relevant websites are just a click away. You can easily download the latest version via the ‘download’ option on the right hand side of this page. If you’d like to get the list regularly, add your name and email in the spots provided. An e-newsletter will be sent to you each month, containing the ‘download’ link. 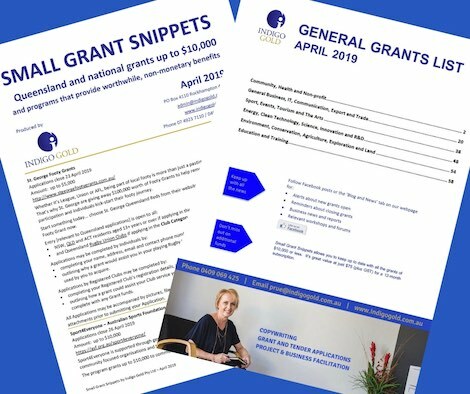 Small Grant Snippets gives you information about all the additional Queensland and national grants that are $10,000 and under. 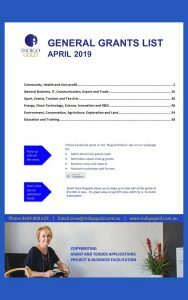 Updated monthly, it features grants from Government, philanthropic, organisational and corporate sources. If you’re a small business operator, you’ll also find it helpful to keep you up to date with government programs targeted at you. 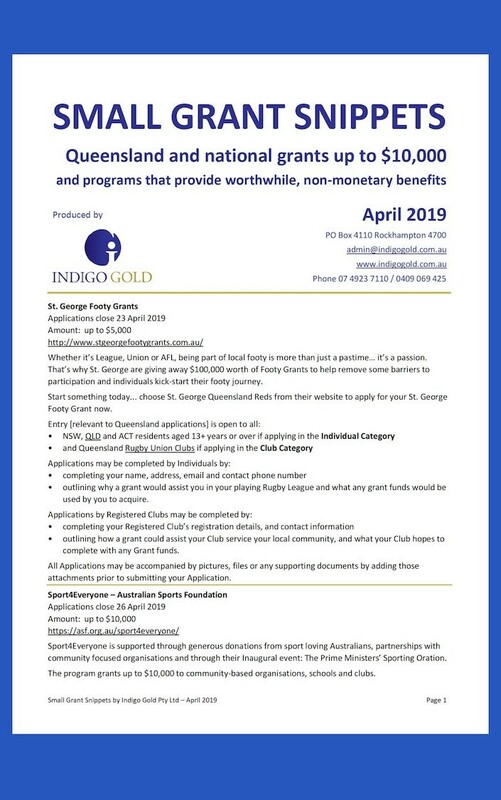 Lately, the Queensland Government is tending to offer smaller grants to help a larger number of recipients. By subscribing, you’ll keep up to date on all the opportunities. Many of our subscribers have been receiving Small Grant Snippets for more than three years – a great indication of the value it provides to them. Some clients use the list to keep abreast of opportunities for their clients, and to package their services accordingly. A 12-month subscription is great value at just $82.50 (including GST). What do you get in Small Grant Snippets? Especially important is that as a subscriber, you will also receive alerts of grants via email so you don’t miss out on opportunities that have short deadlines. Furthermore, the alerts aren’t posted on our Facebook or Web pages. This is because the information is exclusively for Small Grant Snippets subscribers. How does the ongoing subscription work? Following your initial download, you will receive new editions for a further 11 months. They’re sent between the 12th and 17th day of the month and will come via an e-newsletter from Indigo Gold. Don’t be worried about missing opportunities. To keep you up to date, you’ll receive alerts about any new grants with short deadlines. You’ll be contacted by an Indigo Gold team member approximately four weeks before your subscription expires, to discuss renewal. If you need a little help to learn how to write winning grant applications, we can help. We’ve been writing winning grant applications for many years – from $10,000 up to $20M, so we know what works. We’re happy to pass on our knowledge and tips to others, so have developed a online grant writing webinar series. This allows you to do the training wherever and whenever it suits you. 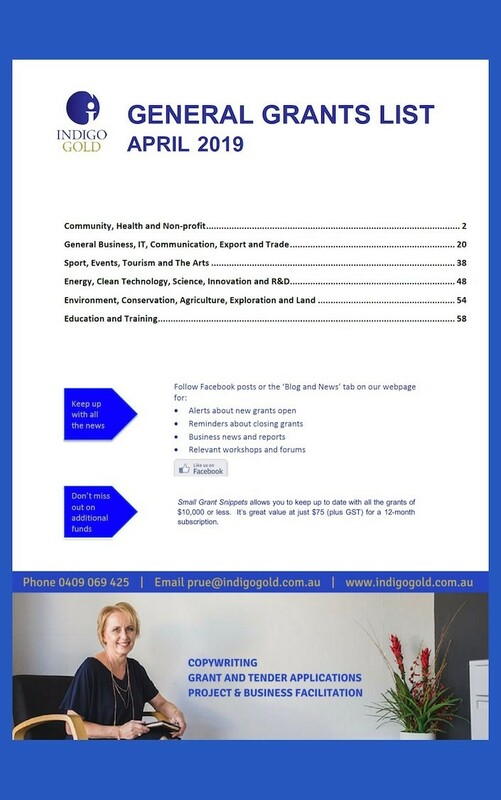 We also conduct grant writing workshops throughout Queensland. Workshops can be custom-designed to meet different needs, numbers and duration. Contact us now to find out how we can help and the costs involved.